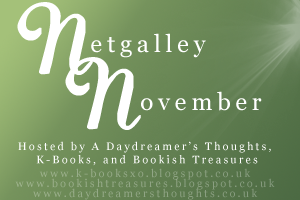 I've decided to take part in Netgalley November, which is a thing being co-hosted by Faye from A Daydreamer's Thoughts. It's a brilliant idea. I did a lot a few weeks ago to bring up my feedback ratio (by 20%!) but more is always needed. I shall do my best to update this page throughout the month with my progress. I think the above two numbers will be the best judge of how successful Netgalley November will be for me. I think if ALL of the books below were read and reviewed this month, my percentage would go up by a further 20% so my goal is ... a 10% increase by the end of the month. Which means writing reviews for the 4 books I've already read and reading and reviewing a further 6 titles. Wish me luck! Wish me luck on my goals! Are you taking part in Netgalley November? Are you willing to share your feedback ratio perecentage? What are your Netgalley goals this month? Good luck! I don't do Netgalley because I know that if I did I'd end up with just too many books! More Than This is on my TBR pile too and I'm really looking forward to reading Shadowplay when it comes out. I enjoyed Crown of Midnight and Playing Tyler, and after your vlog yesterday I'm looking forward to reading your review of Crash Into You! Thanks, Cait :) I've worked out lots of good tips for raising my ratio... sending publisher feedback when the book had been archived before I sent to my Kindle. Giving a star rating. Sending links to comments made on Twitter/FB page. The only book we have i common on our netgalley TBR's is Time After Time which is what I am due to start today. Has anyone else noticed the number of books they are approved for go sown since Netgalley started to provide a percentage their profile? I've been rejected for the last 4 books i've requested. After the first week of Netgalley November I am at approx. 50%. I don't know how close to 80% I will get ( my math's isn't very good) but I am aiming to read 8 books during the challenge. My plan is to start with the recently published and work my way back through my galleys. Now, if only I could resist the urge to request more titles. Apparently the publishers could ALWAYS see that percentage. The only change was that Netgalley allowed US to see it as well. So it might just be a coincidence that you've been rejected a lot lately. I have too. Last month I was sending loads of feedback to Netgalley and worked out that every time I sent feedback my ratio would go up by just below 1% - which is why I reckon if I read everything I have NOW and review it, it'd go up by 20% I have no idea about yours though :) GOod luck!